I love our house. It was a fixer-upper when we bought it, and it still is, but we’ve made such great progress that I really love living (and working) in it. But there’s this one little strip that is my Achilles heal. Every time I look at it I think “Ug! I’ve got to do something about that…” and, of course, I never do. It’s not technically our property. We’re on a corner, and we have a 6-foot fence going down the long side of the property. It used to be a handmade ancient 4-foot fence with a wood shed that the insurance company said “Uh, uh. We’re not insuring THAT fire hazard.” The strip that bothers me is the strip of land outside the fence running alongside the street where random cars park, and some folks in our neighborhood like to hang out and leave their trash strew all alongside it. It’s a total eyesore. But it’s not technically ours. It’s city land, and I wish the city would just put one of those nice cement trash bins out there. But we all know how likely that is. We have a lot of great neighbors, and it’s a pretty quiet neighborhood, especially for being the further east edge of San Diego city. If you look all up and down the street you won’t see trash ANYWHERE else, except our little strip. So. Frustrating. But I think whoever is doing this just got in the habit back before we moved in and never got confronted and just doesn’t think about it anymore. But I am not the kind of person who would confront a stranger directly. But I do like to fix problems and provide solutions. I figured that the trash was left there because it was just convenient for them. So I just need to make it at least equally convenient to put the trash where it belongs. I’m happy to collect the trash if they’ll just put it in a can. Easy. So I went hunting for a way to have a trash can more or less secured in the ground. Let me tell you: there’s LOTS of ways to do that, and generally they all average around $250. Once I saw that I knew I had to get creative. 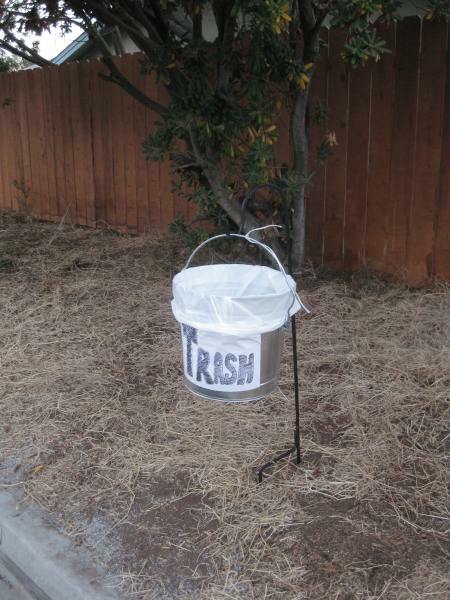 I thought if I found a basically square-ish trash can I could bolt it to a frame and stake it in the ground. But even that was going to run me at least $60 at HomeDepot. Then I spotted this beauty. I find out instead that my neighbors take the hint and start using it. Win for them, modest win for me (I still have to take out their garbage. After several weeks, there’s less and less garbage in the bin AND on the street. They start being better care-takers of their trash completely. Total WIN-WIN for everyone! I think this is going to go well, one way or another. I’ll keep you posted. Hey Romin, it’s complicated. I’m working on a follow-up post, but still working out the kinks of this whole experiment first. More to come, I promise! Thanks for dropping by!